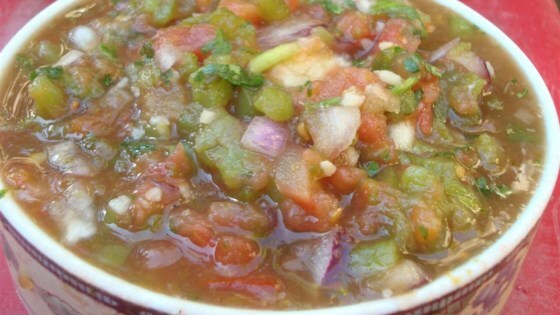 "This is a fun take on a fresh salsa that is sure to be a hit at any party. This salsa does pack quite a punch, but you can always use fewer peppers." Halve the green bell pepper, red bell pepper, jalapeno peppers, and serrano peppers lengthwise and discard stems and seeds. Place on baking sheet and brush the peppers with olive oil. Roast peppers under the broiler until the skin blackens and blisters, 3 to 5 minutes. Place peppers in a bowl and cover with plastic wrap; allow the peppers to steam until the skins loosen, about 10 minutes. Peel skin off the peppers and discard. Combine the green bell pepper, red bell pepper, jalapenos, serrano, onion, tomato, garlic, cilantro, diced tomato with juice, lime juice, salt, black pepper, and beer in a blender. Blend to desired consistency. Transfer to a bowl and allow to cool in the refrigerator for 30 minutes before serving. This salsa was very tasty! The roasted peppers made it extra good, and were quite easy to prepare. I used fresh tomato only, and used a whole onion. I had to cut down on some peppers for the sake of the kids. Otherwise we're super pleased.